You can’t talk about electric cars without talking about electric car charging. So, it’s not surprising that the charging section of our new 93-page electric car driver report is the largest section of the report. 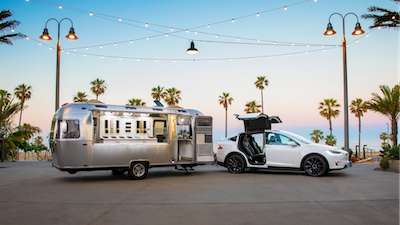 The biggest differences when going from a gas car to an electric car are probably the lack of emissions, the instant torque, the quiet driver, the fact that you can often charge at home (and/or work), longer “refueling”/charging times, and shorter driving range. Charging is the only factor there that comes with pros and cons — more convenient charging locations … but not always; longer charging times … but no need to stand at the pump, and the ability to have a charging station in your garage. So, it was with a great degree of curiosity that we explored EV charging experiences and needs by type of EV and region for our latest EV report. What’s the story for Tesla drivers, non-Tesla fully electric car drivers, and plug-in hybrid drivers? What’s the story for Americans vs Europeans? We already covered the desire and demand for fast charging and superfast charging in a previous section, but we dive much more into other charging matters here. Jump down below the line for the results. The previous section examined demand for fast charging and super-fast charging, but what about normal home charging and public Level 2 charging? This section delves into those matters in several ways. 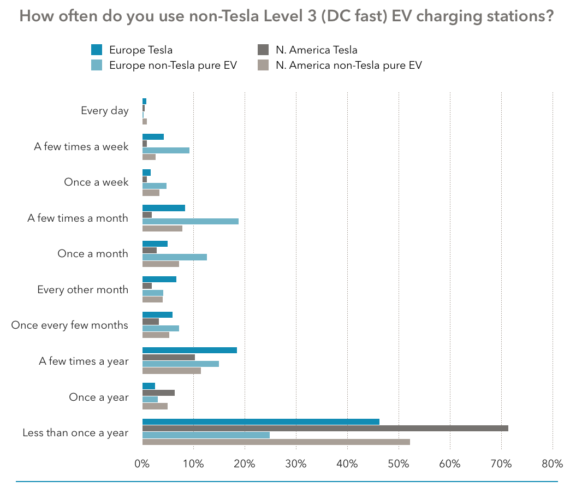 First of all, let’s get a sense of how much current EV drivers actually use Level 2 charging. In general, the biggest implied takeaway there for me is that the public charging market is going to be much, much smaller than the gas station market. People don’t need to charge much outside of home (and even less so if they have workplace charging, which I assume will become the norm). Another point to highlight right here is that living with an electric car is super convenient. 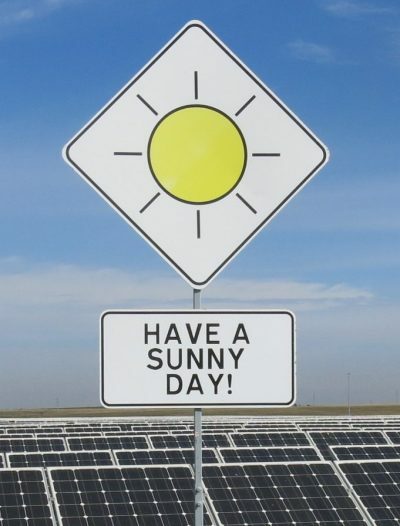 Due to the convenience of home charging (you can essentially start each day with a full charge), the need to go out and find a charging station at some point in the middle of one’s errands is unusual. 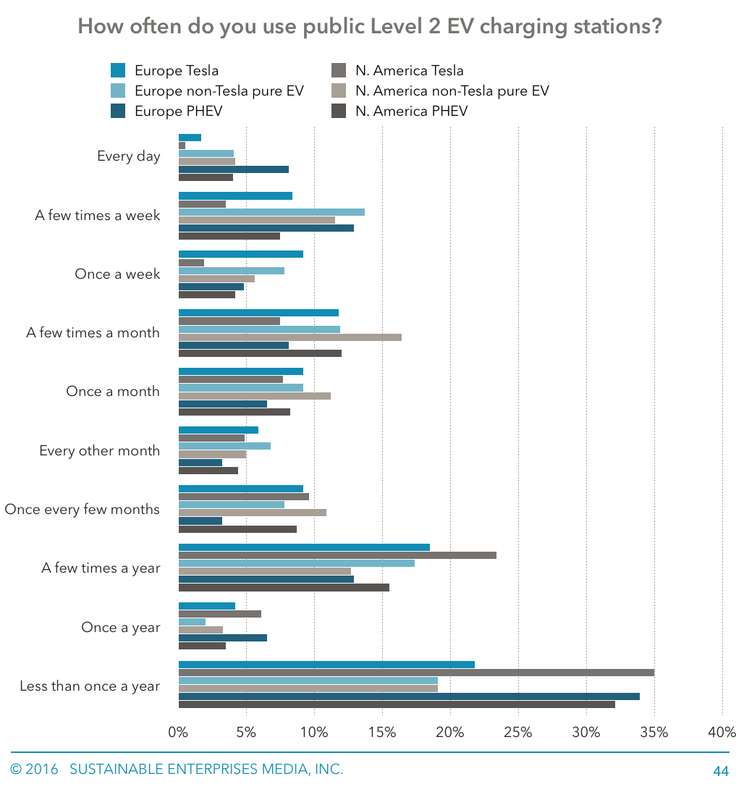 That said, some EV drivers do currently charge at public Level 2 stations every day, and many others do so a few times a week or once a week. As CleanTechnica’s long-term Nissan LEAF reviewer with no home charging has shown, even that can be extremely convenient and pleasant, but it does require adequate and properly placed public charging stations. 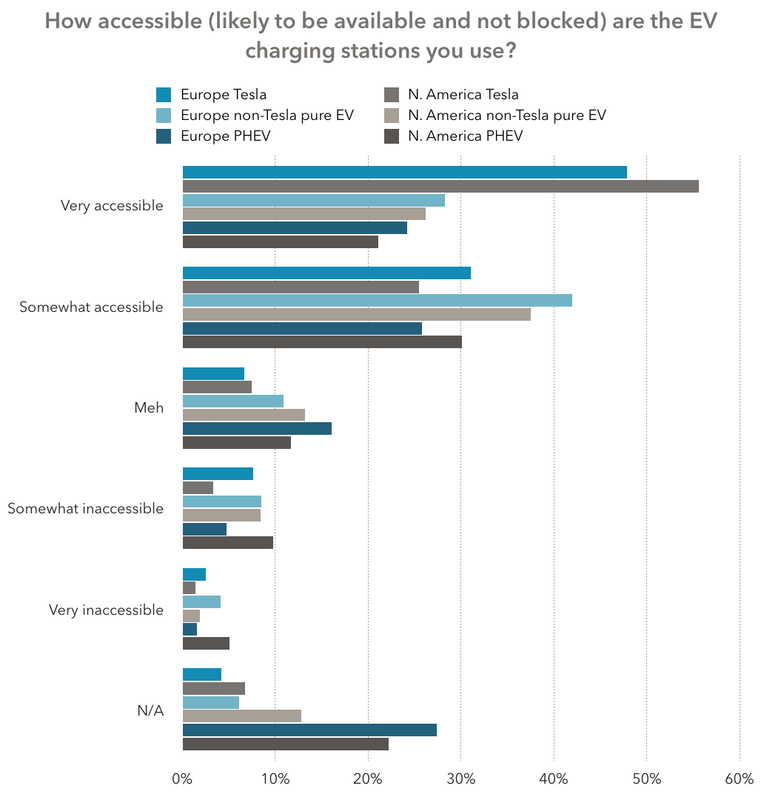 It’s unclear to what degree respondents rely on public charging rather than use it just because it’s there (well, plug-in hybrid drivers certainly don’t “need” it), but these responses do indicate decent use of public charging. As I think the results from Tesla drivers in North America show, however, if the car has enough range, this use can drop considerably. 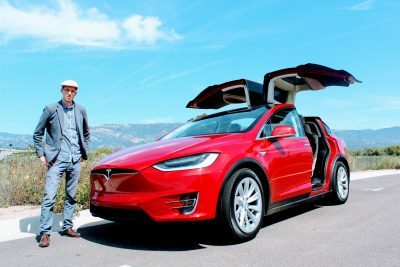 When you consider that we seldom drive more than 50 miles in a day, it’s logical that we would regain that range via overnight charging and, if our car has >200 miles of range, we would rarely need to use a public charging station. For the time being, though, it seems that at least one quarter of EV drivers will use public charging stations at least once a week if charging stations are available (and cheap). And maybe they’d use charging stations more if they were widely available. Similar to the above topic, we queried survey respondents about their use of Level 3 charging (aka DC fast charging) and we queried Tesla drivers about their use of Supercharging. To clarify, Level 3 charging as it is available today allows for a charging rate of 24–50 kW, whereas Tesla Supercharging can offer up to 120 kW. 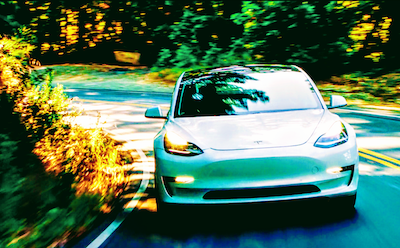 In human terms, that means adding approximately 50–100 miles of range in ~30 minutes (Level 3 charging) or up to approximately 170 miles in ~30 minutes (Supercharging). Additionally, Level 3 charging often isn’t cheap, whereas Supercharging was “free” for Tesla drivers up until early 2017. So, unsurprisingly, given the general lack of necessity (and lack of capability for some electric cars), Level 3 charging is seldom used whereas Supercharging is quite commonly used by Tesla drivers. 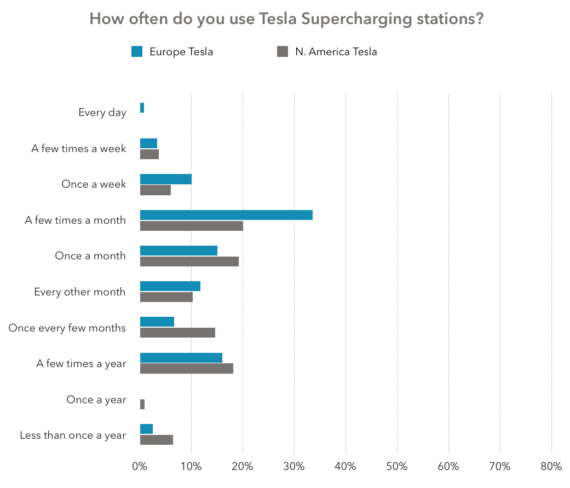 Given how many respondents indicated they use Supercharging a few times a month or even more frequently, it seems that the 400 kWh per year of free Supercharging is likely to be quite a bit less than many initial owners have been using. I doubt this will deter many buyers, but it’s an interesting drop in product value nonetheless. 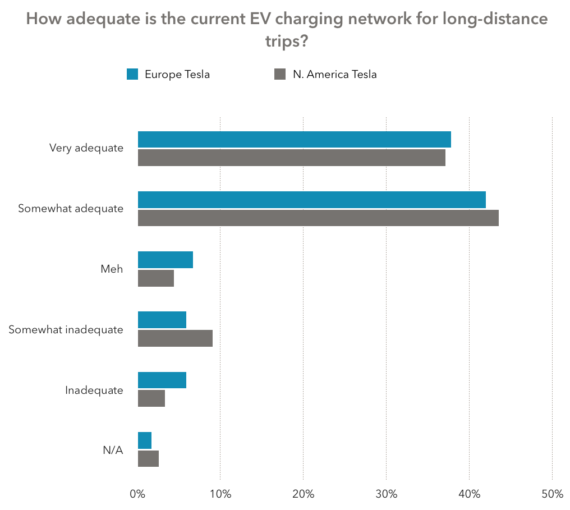 The vast majority of Tesla drivers (81% of North Americans and 80% of Europeans) find the current network adequate. Though, only 37% of North Americans and 38% of Europeans consider it to be very adequate. Presumably, those percentages will rise as Tesla further builds out its Supercharging network. The challenge here is that we don’t actually know how many of the respondents were considering the Supercharger network (exclusive to Tesla vehicles at the moment) when answering this question. 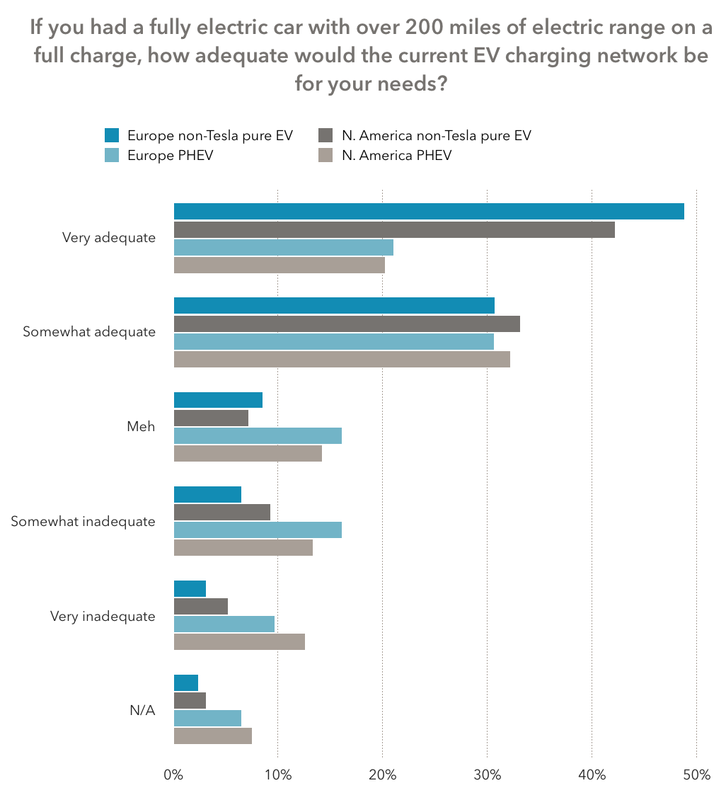 Nonetheless, it seems clear that most respondents see current EV charging possibilities as good enough for long-distance travel — if not super adequate for that. Critical factors for public charging stations to be useful are that they be convenient, accessible, and reliable. We dove into these topics a bit via our surveys as well. 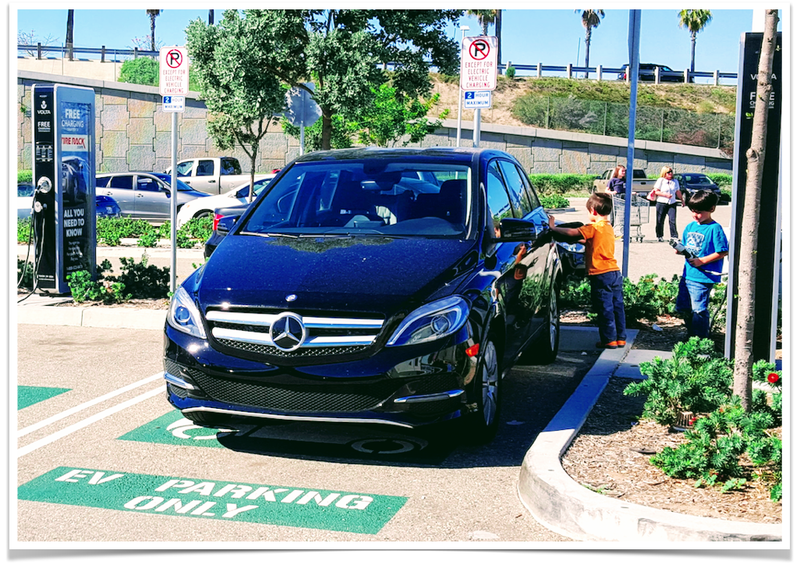 There’s certainly room for improvement, but our results indicate that current EV charging infrastructure is quite convenient and accessible for EV drivers of all types. There’s notable variation by type of EV, but the overall results are pretty positive, especially if you consider that next-gen EVs will often have over 200 miles of range instead of 60–110 miles. One more qualitative charging station matter we looked into was reliability of the charging stations EV drivers use. The responses on this matter were approximately what was expected from previous research. Yet again, there’s certainly room for improvement — can you imagine 10–30% of gas car drivers having reliability problems with the gas stations they use? 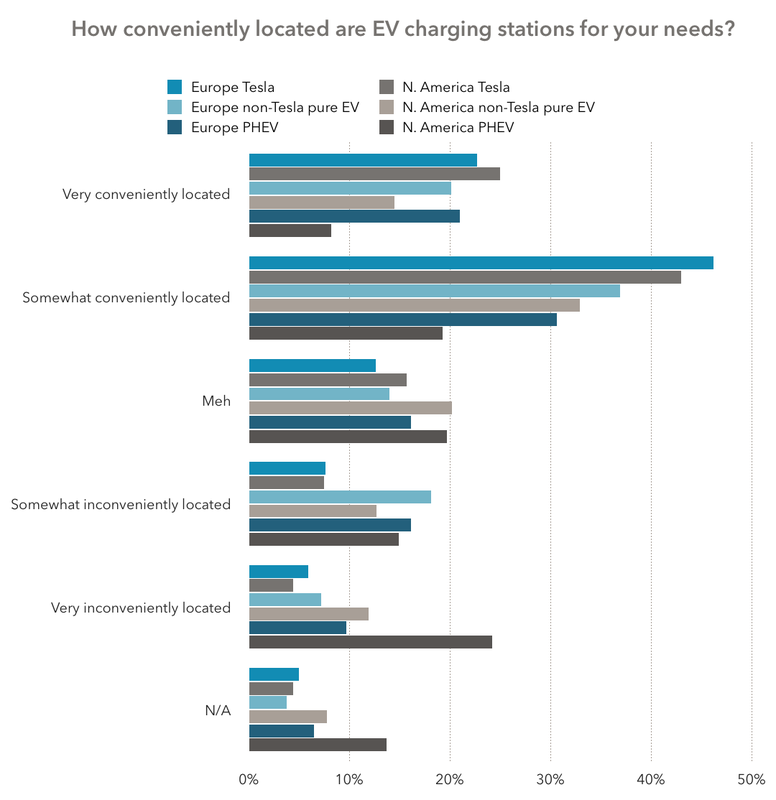 Nonetheless, a large majority of respondents did consider the charging stations they used to be somewhat or very reliable. Overall, the findings from these questions and responses showed that current EV drivers do, in large part, find the current charging infrastructure convenient, accessible, and reliable, but there’s a lot of potential to improve on each of these matters. 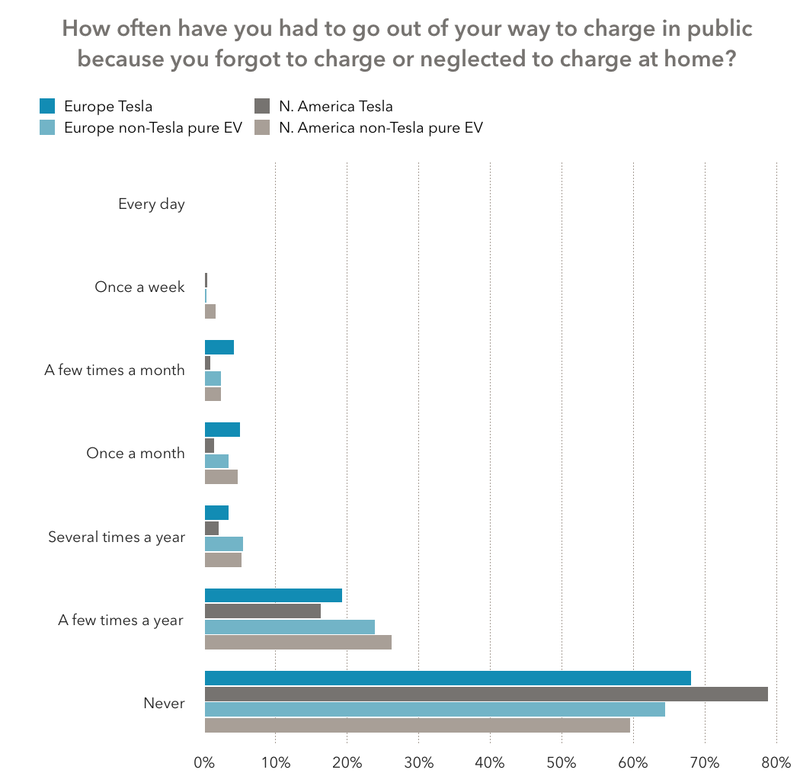 As with other studies of early EV drivers, the vast majority of the EV drivers we surveyed had home charging, but rather than 97–99% as some of these other surveys have found, the percentages from the groups we surveyed were 88–96%. 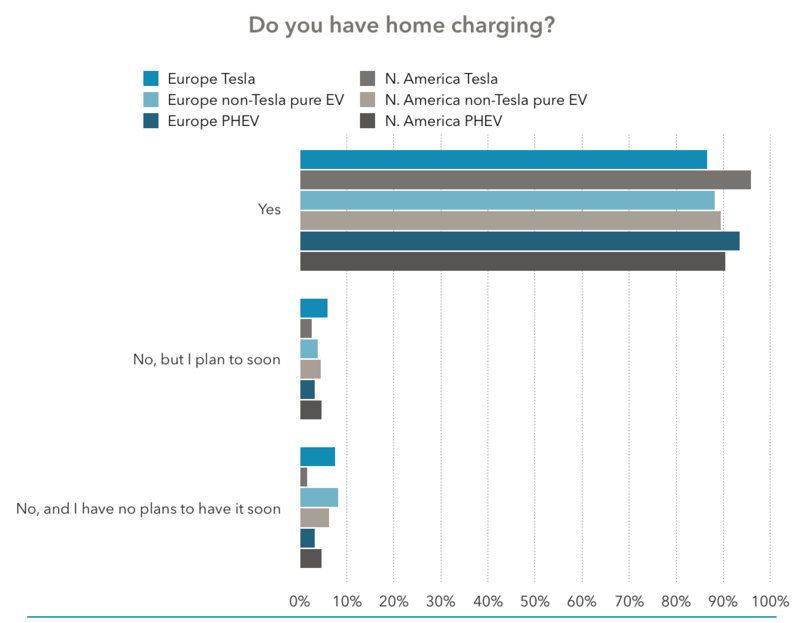 However, if you add in the respondents who planned to have home charging soon, the numbers rise to 92–98%. 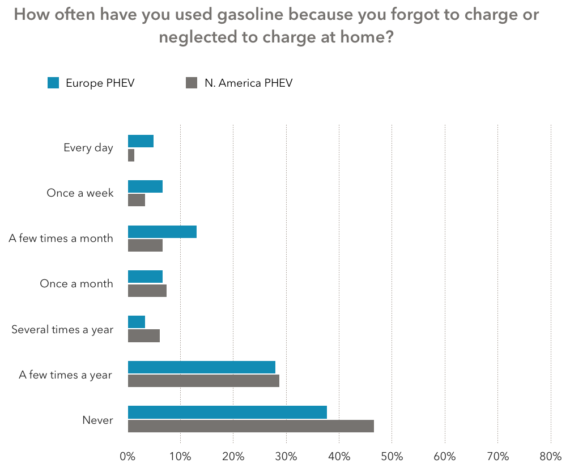 One charging-related question that we haven’t seen elsewhere and brought into this study was how often forgetting or neglecting to charge at home led people to inconvenience later — either needing to charge in public (in the case of pure EV drivers) or needing to get gas (in the case of plug-in hybrids). The responses indicated that it doesn’t happen often, but it does happen for many drivers. 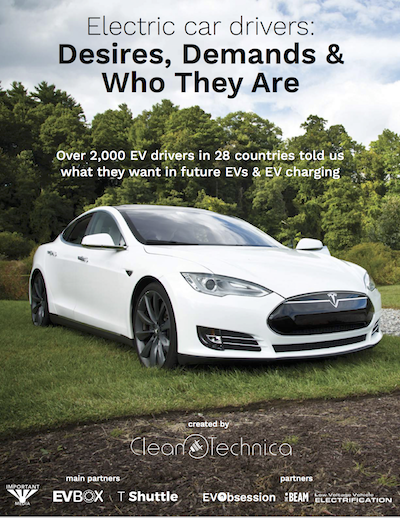 Related: Electric Car Charging 101 — Types of Charging, Charging Networks, Apps, & More!